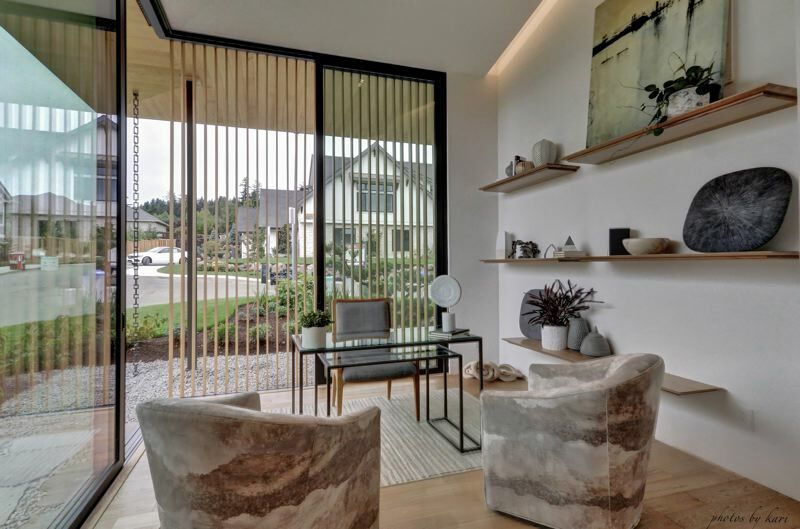 This year's NW Natural Street of Dreams features styles ranging from an English farmhouse to a contemporary home designed to meet Japanese seismic codes with an impressive backdrop — The Reserve Vineyards and Golf Club — that inspired a lot of the design work. Named The Vendage at The Reserve, the six new homes in South Hillsboro launch what will become the largest master planned community in Oregon and has been about 20 years in the making. When completed, it will house up to 20,000 residents in three developments with amenities such as walking and bike trails and nature preserves, said spokesperson Adrian McCarthy. "It's something we've never experienced in the Street of Dreams before," she said. The homes overlook holes 10, 11 and 12 at the golf course, which provided ample motivation for designers and builders to make the most of spectacular views and natural lighting in their homes. Street of Dreams 2018 kicked off July 28 and during opening weekend the designers and builders who worked on the homes had a chance to see visitors' reactions to their work. Gerald Rowlett and Westlake Development built Fairway Manor, a 5,200-square-foot English farmhouse-style house, with Tiffany Home Design. Rowlett, who has developed 10 homes for Street of Dreams over the last decade, said this year's event stands out for a couple of reasons. "We're on a golf course that is amazing so we have a beautiful setting. We also have a lot that is very comfortable in size and allowed us to build what the client was looking for without restriction," he said. Some of his favorite elements of Fairway Manor include a gardening room that wraps around the back of the home and transitions into a solarium. "It's a real gardener's delight and it drew a lot of attention during the opening days," he said. The design incorporated large barn doors to block off areas such as a home gym when they are not in use. "Barn doors have become popular over the last couple of years and they really become moving pieces of art," Rowlett said. Fairway Manor also features a formal dining room, and he noted that while housing trends have moved away from such space it was important for these particular owners. "Some people just really enjoy that room for certain occasions and this is one of those couples. The house is really designed for the family and is all about family." With more than 140 windows to allow for abundant natural light, it was a challenge to ensure the house met energy-efficiency performance scores. "When you put a window in a house it's like Swiss cheese and it's going to let things in, so we had to look at how to meet performance requirements with so many windows," Rowlett said. 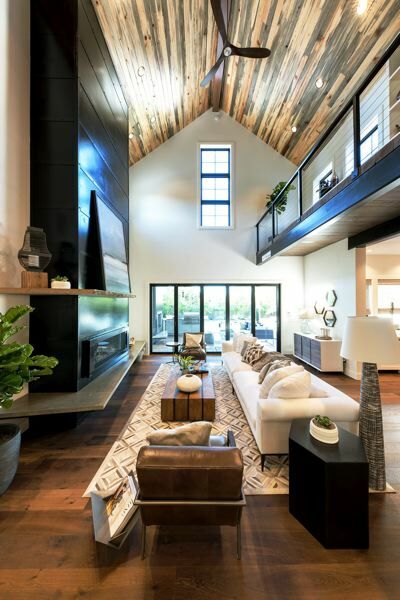 Mike Harn of Anlon Custom Homes developed the 4,783-square-foot Hearth & Home with Wendy O'Brien Interior Planning and Design. His favorite features include an office that sits on the mezzanine level, above a garage specially designed for a golf cart. "With Hearth & Home we drew the plan from scratch and it may be my favorite plan we've ever drawn. Even though the house is large by most people's standards, it's incredibly homey and when you walk in you feel like you could live there," he said. Outdoor living space is a popular trend and Hearth & Home capitalized on its location with an outdoor kitchen, bar and other amenities. Harn said the home also was designed to accommodate people at any stage of life, from parents with young children to older residents who want to age in place. Harn, who participated in the Street of Dreams for the first time this year, also led construction of Suteki Harmony, a 4,320-square-foot Northwest contemporary house, with Toshiaki Chiba of Suteki. Harn said he appreciated the opportunity to include a reflection pond and the challenge of building a home that was designed to meet Japan's stringent seismic codes. "It was a ton of fun to do that. The great thing with the Street of Dreams is you can do things you don't do every day," he said. "We have a custom homes division, but this is a chance to work with really talented partners and to use superior products. The other builders are tremendous. They all drew great plans and they are all unique." Scott Bowles and Bill Winkenbach of BC Custom Construction partnered with Carin L. Atterbury of Surface interior design to create Private Reserve, a 4,939-square-foot home that reflects the Pacific Northwest contemporary style. Its highlights include a radiant system in its concrete floors that maintains a consistent temperature throughout the house as well as a grand entrance that is set back into the house. While the backyard provides views of the golf course and sunsets, a front courtyard with a water feature and a patio allows the residents to avoid the sun's afternoon heat and have a private sitting area away from golfers, Bowles said. Private Reserve is the 13th house Bowles has built for the home tour since 1999, and he said that while the construction timeline for Street of Dreams is always a challenge, starting to build this year's home in April added to the project's complexity. "Anytime you're building a house you are on a very tight schedule, and we have a great team of people. Trades are always an issue and finding people to step away to take on big projects can be difficult," he said. Bowles added that the Street of Dreams presents a unique opportunity for each team to showcase the latest trends in architecture, interior design, construction and residential technologies. "People come to the Street because they are building, designing or remodeling and they want to get ideas, so we ask our partners to showcase the newest products that may not even be on the market yet so we can pique their interest," he said. 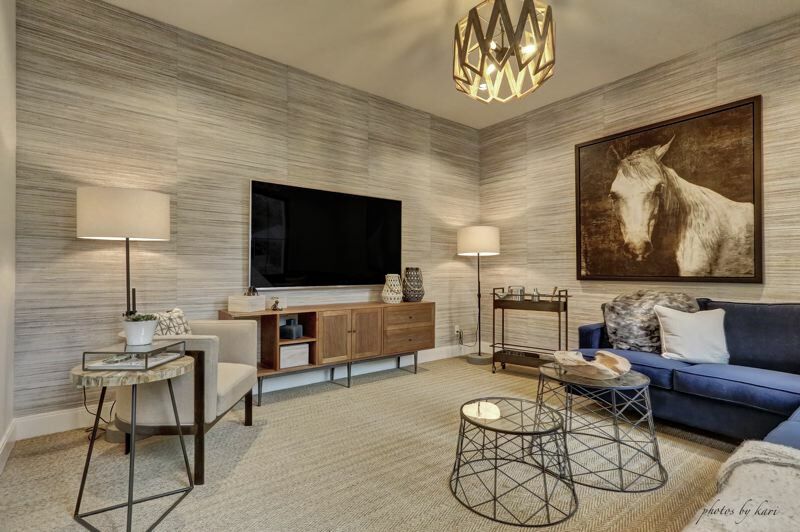 The two additional homes showcased in this year's event are Graceview, a 5,420-square-foot farmhouse-style home built by Legacy Built Custom Homes with Jamie Opsahl Interior Design, and Serenity, a 3,696-square-foot house built by Pahlisch Homes. This year's NW Natural Street of Dreams, named The Vendage at The Reserve, is situated near the The Reserve Vineyards and Golf Club and features six new homes in South Hillsboro. It will launch what will become the largest master planned community in Oregon and has been about 20 years in the making. When completed, it will house up to 20,000 residents in three developments with amenities such as walking and bike trails and nature preserves.